Why am I infatuated with vegan restaurants? Well, one of my deepest passions in life is travel, and coupled with my other loves of good food and veganism, it's a perfect match. There's absolutely nothing in the world like stepping out of your comfort zone in a new city or country and experiencing the real culture of a place you don't yet understand. When you travel, you expand your belief system beyond what you inherently know, and you're forced to consider other possibilities. Many international travelers believe, as a I do, that eating traditional food is one of the best ways to really get a feel for a culture, but many of those same people think that vegans miss out. Although some cultures pride themselves on their meat and dairy products, most also take great pride in their vegetables and whole grain dishes. Some of the coolest meals I've had out of the country were ones where I was tucked away in some tiny restaurant in an alley and using my translation of "I don't eat meat." In the US or other English-speaking countries, it's easy. And if you get to eat in a pure vegetarian restaurant, it's the best of both worlds. I am always deeply amazed at the creativity of different chefs, and I tend to come away inspired and filled with even more love of travel, food, and compassion for all beings. Before I go absolutely anywhere, I scour the internet for vegan restaurants in that city. We're really lucky to have so many detailed restaurant directories now, and I appreciate being able to see the listings. What I really value is the reviews; there's no advertising like word of mouth to make or break a restaurant. There are some restaurants that have a cult-like following, and if you swing in the vegan circles, you hear about them all the time. Some I've been to, and others are just on my bucket list. These are the vegan restaurants I've indulged in so far in my life, and what follows are my honest reviews. Flying Star Cafe: Fun, modern retro non-veg diner that has delicious vegan options like the tofu breakfast burrito I enjoyed. Firestorm Cafe and Books is a cute bookstore and vegan cafe with flavorful sandwiches. Rosetta's Kitchen: comfort food in the heart of downtown Asheville. Cafe Sunflower: I went with my non-vegan mom and she was quite impressed, especially with their peanut butter mousse chocolate cake, which I think she said was the best cake she's ever had. Although they don't focus on Asian styles, I really enjoyed their dumplings. Dough Bakery/Gutenflesichers: A vegan bakery/deli combination that makes its own vegan deli meat and amazing vegan desserts. Healthful Essence: Caribbean style soul food; we loved the live salads and the jerk "unduck." They also had amazing coconut drinks. Soul Vegetarian: Really good Southern comfort food, ala mac-n-cheese, collards, and fried tofu. World Peace Cafe: Cool, spiritual atmosphere with great breakfast dishes and delicious sandwiches. The classic peace burger is their specialty. Eden Vegetarian Cafe: It was closed for the season by the time we arrived. Jeannie's Breakfast: Nice, fluffy blueberry pancakes, with a few other vegan options. Morning Glory Bakery: They have a tempeh sandwich and a hummus sandwich. Amitabul: Vegan, macrobiotic Korean food from heaven. LOVE this vegan restaurant. The Chicago Diner: The famous vegetarian diner; we loved the nachos and the enjoyed the reuben sandwiches. Adding a shake at the end put it way over the top for me with more rich food than I usually eat in a month and I'd definitely skip that dessert next time. Karyn's Cooked: American style food like ribs, meat loaf, lasagna, and buffalo wings. Native Foods: The chain started in California and is slowly spreading across the country. Here we had the most realistic fake chicken I've ever tasted. Cosmic Cafe: It has a fun new age vibe, and when we were there a local singer was perched a few yards away. The Spiral Diner: A retro modern diner with an all-vegan, from scratch, and mostly organic menu. We were really excited with the fun burgers and sandwiches, and my husband indulged in the Viva Las Migas brunch item. Leaf Vegetarian (Boulder): We had a delicious jerk tempeh dish with black rice, an interesting take on seaweed salad, and a really cool coconut panna cotta for dessert. This is also where I tried my first shrub, a vinegar drink, and it was awesome. Sweet Action Ice Cream: They have a few vegan ice cream options daily, and it's cute, packed ice cream shop. Watercourse: An awesome vegetarian restaurant where almost everything can be made vegan. We went a few times, and our favorites were the banana bread French toast, the Dona Lee wrap, and the seitan buffalo wings. Linger: Very chic restaurant that focuses on small dishes, and an international flair. Root Down: Owned by owners of Linger, with the same focus on shared plates, but with a more gourmet American food selection. Wynkoop Brewing Company: Really tasty beer and several vegan dishes on the menu. In Seaside is Raw and Juicy, a raw food cart in the middle of town. There's also an ice cream shop called Dawson's that serves a few flavors of sorbet. Grayton beach has Cafe Hibiscus, which serves breakfast throughout the week and brunch on the weekends and offers a few vegan options. There are a few other places we enjoyed as well. Here's the full review of the Seaside-area gulf coast beaches and their vegan restaurants. Real Food Daily was closed when I tried to go... horrible timing! Stuff I Eat: In Inglewood near the airport, and so freaking good! It's a hole in the wall place, so I wasn't expecting the freshness and innovative food that we had. I had a sumthin-sumthin burrito with fresh vegetables, beans, guacamole, which was piled high with fresh goodness. The carrot un-tuna salad that came on the side was perhaps the best thing we ate. Truly Vegan: Loved the noodle dishes, and I'll never forget the tahini sauce I had on the Oriental Salad. Vegan House: Another Asian style vegan restaurant with good noodle dishes. Vinh Lo Tofu: You have to drive to the Valley to get to this gem, but it's the best vegan Vietnamese, so it's worth it. I had enormous trouble deciding what to order, so I let the owner pick. I ended up with a lot of fake meat, which is what they're famous for, but I'm not super interested in fake pork products. The noodle soups and spring rolls were awesome though. Check out this page for a full list of Nashville vegan restaurants, including places that aren't vegan but will make a meal for you. Wild Cow Nashville: A wildly popular cafe that is always packed and specializes in salads, sandwiches, and great desserts. Candle 79: Intense gourmet vegan restaurant experience, and we were thrilled with almost every one of our dishes, though it can be pretty expensive. They also sell the peanut butter bomb from Vegan Treats in PA.
Cafe Blossom: The two locations are sisters to the more established Blossom, and they boast "the best veggie burger" my husband has ever had. Babycakes: It's super famous, and super tiny and cute, and they use whole, healthy ingredients in all their baked goods. We were blown away by their skinny buns. Soy & Sake: This restaurant became and instant favorite with my omni family; especially because of my brother-in-laws love for seitan. The chicken satay appetizer was the big winner. Hudson Valley Chocolate: In Saugerties, this candy shop makes a delicious cranberry walnut granola. Horizons: So insanely delicious, but unfortunately it closed in 2011. The owners opened a new place called Vedge. New Harmony Vegetarian Restaurant: An all-you-can eat dim sum restaurant. The best items were the steamed dim sum. Grindcore House: Coffee shop in South Philly with free trade coffee, vegan sandwiches, and Vegan Treats desserts. Little Lad's Bakery and Cafe: We were blown away by the spirit of the owner when we stumbled upon this little vegan restaurant gem. They have an inexpensive buffet lunch with good, fresh food. And, the big secret is their amazing "herbal popcorn," which we have been attempting to recreate, failing, and then calling to have them ship it to us, ever since we first tasted it. Their snacker jacks popcorn is really good too. Voodoo Doughnuts: The iconic doughnut factory that always has a line out the door. It has tons of options, but we went for the vegan voodoo shaped doughnut with cherry jelly filling, chocolate frosting, and a pretzel stake through the heart. Portobello Vegan Trattoria: Absolutely delicious vegan Italian food. We loved the gnocchi and the iconic vegan tiramisu. Blossoming Lotus: Delicious upscale vegan restaurant where everything we tasted was perfectly seasoned and cooked (or raw). Our favorites were the Jamaican jerk tofu and the three cheese lasagna. Dave's Killer Bread: We loved their bread at the farmers market so much that we stalked them all the way to their factory outlet, where we loaded up on bread to bring home. Their sin-dawg is amazing. Bob's Red Mill: Since it's across the street from Dave's Killer Bread, we stopped in a picked up some obscure bulk items. We also tried their vegan pancakes from their upstairs cafe. Cha-Ya Vegetarian Japanese Cuisine: Very fresh and filling Japanese dishes. Golden Era Vegetarian Restaurant: Asian style food made without MSG, including very convincing faux meat. Loved the faux pho. Herbivore: A menu just loaded with vegan options that gives you the feeling either that you can't go wrong, or that you might miss out by choosing the wrong thing from so many dishes. We had really good brunch food; sourdough French toast and a southwest scrambled tofu. The dinner we had at Millennium was the best gourmet vegan meal I've ever had at any vegan restaurant. Fresh Mint: I've had better vegan Vietnamese food, but it might be partially because we had it delivered rather than eating in the restaurant. Green New American Vegetarian: They serve American comfort food, like sandwiches, wraps, noodle bowls, and ice cream. We were blown away by the spicy seitan buffalo wings, as well as the secret bbq chicken sandwich, which won a PETA award in 2011 for best faux meat sandwich in the US. Nourish: My favorite thing on the menu was the sweet potato and avocado salad. Their "healthy protein" burger was good too. Plum Bistro: An upscale restaurant in Capitol Hill that serves high end comfort food, like their famous mac 'n' yease. Plum Cafe: The sister restaurant to the Bistro, makes sandwiches and sells mac 'n' yease by the pound. Sutra: An amazing culinary experience with rotating local seasonal fruits and vegetables as the main focal points, two seatings a night in the tiny restaurant. 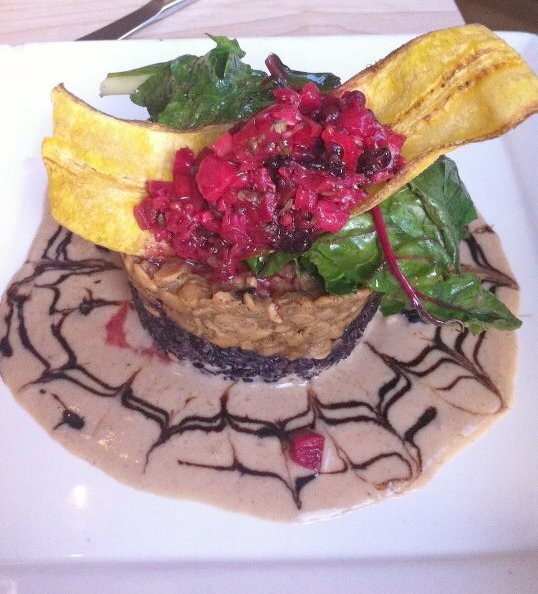 Vida de Cafe: A delicious raw food restaurant at St. Pete Beach that serves salads, sandwiches, and entrees. Sticky Fingers Bakery: Renowned for their cupcakes and cinnamon buns, and they made our wedding cake. They also have savory foods like "tuna" grilled cheese sandwiches, hot dogs, and nachos. Java Green: Absolutely love their jobche noodles, as well as their fresh salads and noodle dishes. Cafe Green: The sit down version of Java Green, and their best dish also seems to be the jobche with vegan boolgoogi. Ecocafe: A pretty cafe near Andrassy with nice pastries and several lunch options, as well as a tiny health food store. Here's a recap of my favorite places in Budapest for vegan food. Country Life -Melantrichova: A grocery store with a small buffet section that you can take upstairs. They had really interesting soups and faux meats. Lehka Khlava (Clear Head): We went to this vegetarian restaurant a few times, and really loved the friendly service and fresh seasonal food. Every room is decorated differently, and it almost feels like you're in a different restaurant every time you eat there. Vegetka: Another small, unique grocery store that has a restaurant attached, but when we went the restaurant was not open for the season. Ard Bia at Nimmos Restaurant (Galway): A farm-to-table restaurant located in an old building right on the river. While not a vegan restaurant, our waiter had an amazing understanding of the diet, and put together a few delicious sandwiches for us, and included some homemade oat crackers with an appetizer dip. I loved their tea. Blazing Salads (Dublin): This is a small salad take-out bar with a small bar bench you can dine in with. 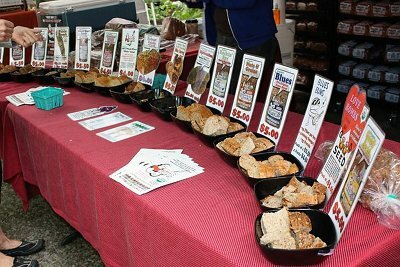 We enjoyed a few of their lentil salads, soups, and Czech pastries. Cornucopia (Dublin): You order up front and seat yourself in this always-busy vegan restaurant. Our omni friends loved the different types of casseroles and salads, and the portions were huge. Down to Earth: (Dublin) Tiny convenience store with grocery items. Quay Coop (Cork ): Downstairs is a coop and upstairs is a multi-level restaurant with rotating daily dishes. We went a few times and enjoyed everything we ate. Eatwell Foods (Belfast): A tiny natural foods market with expensive prices because it's the only place of its kind in the area. They also have a deli counter that had a few samosas and Indian-inspired items that we enjoyed. If you're looking for a complete list of vegan restaurants for any one particular city, I highly recommend my favorite directory site at Happy Cow.com.